Like Torts, I am a terrible loser and like Torts, I support this team through thick and thin. Losing streaks come and go but when they come, they ALWAYS brings the doom and gloom from social media. Sure the team has let some leads slip away, missed a few empty nets and perhaps lost points they should have had during their recent losing streak BUT when a team struggles, it is just that a TEAM struggle. Teams win as a team and lose as a team [seems obvious, yes?]. Teams when struggling often meet a team that is at the top of their game and bring with them a win streak. Leading up to the game in question, the struggling team has no business winning the game. Enter the St.Louis Blues who are one of the top teams in the NHL this season. The Canucks were that struggling team January 10th and had no business winning against a team that brought with them a 7-game win streak. Does this sound familiar? The Blues had played the night before and should have been tired…BUT they did not look overly road weary in the first 20 minutes and while the Canucks did not look their best, LACK stood tall making 12 stops. Trouble seemed inevitable if the Canucks could not change their playing style moving into the final 40 minutes. One goal leads (& two goal leads) are almost never safe…especially against the firepower of a team like the St.Louis Blues. The Blues tied the game with a laser shot that evaded Eddie Lack as he was screened with traffic in front. The Canucks needed a hero to step up for the go-ahead goal. They have spent TOO many games relying on their goalies…and needed to reward Lack with at least some offense. Mike Santorelli to the rescue with the go ahead goal! The Canucks found a way to get the lead in the third period and the only question that remained was could they close this game out in a way that they hadn’t been able to do the previous 5 games? Could they hold the lead? The clock was winding down when the Blues pulled their goalie for an extra attacker which has been the Canucks kryptonite as of late and it became fire drill front of Lack as the Blues threw everything they could at him. Full credit to the Blues in this game as they never stopped pushing back. The Canucks were hemmed in their zone unable to clear the puck to the empty net BUT Lack stood tall preserving the victory to end the skid. It was game Vancouver had no business winning BUT they did just that as the Canucks snapped their 5-game losing streak and stopped the Blues from winning 8 straight. Has the team solved all of their issues? No, but they’ve taking a stepping stone into the right direction and can build upon this game as they prepare for a 3-game Pacific road trip stopping in LA, Anaheim & Phoenix. A regulation win in LA on Monday [Jan.13th] would tie the Canucks with the Kings for third spot in the Pacific division and be a HUGE confidence booster. This week we will see the return of Roberto Luongo and by weeks end the return of Alex Burrows to the line up [and it is also possible that Alex Edler could return to the blue-line]! The Canucks have a long way to go yet, it’s true but with the return of Luongo, Burrows and Edler can only help to serve their line up down the stretch before the Olympic break. It all starts when the puck drops in LA on Monday night and the Canucks take on a talented Kings team. The Kings have had the Canucks number as of late which is something the Canucks will look to change as they desire to gain 2 points in regulation. It is not an easy path to the playoffs, but a few wins against division rivals will go a long way to helping secure a playoff berth. Every point in the standings[yes even the loser points in the SO/OT] makes a difference between finishing 3rd or earning a potential wildcard spot. It will be a tough trip BUT it is a great opportunity for the Canucks to pick up some very important divisional points. Happy New Year hockey fans! While we will all be keeping our eyes on the 2014 Winter Classic and the announcement of the USA Olympic hockey roster[Congratulations Ryan Kesler! 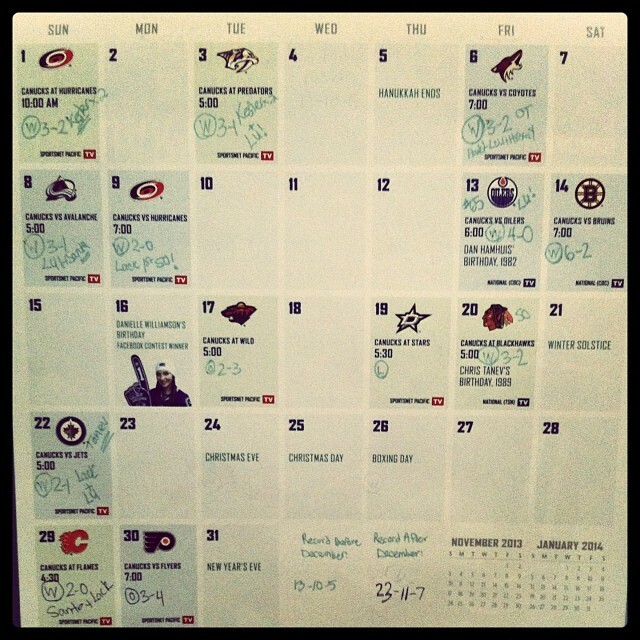 ], I will be taking a closer look at the December that was for the Canucks. Spoiler alert: it was fantastic! November was NOT a good month for the Canucks as they could not solve the riddle of how to win back to back games no matter how good they played. November was the month they survived and December was the month they thrived. In December the team posted an impressive 10-1-2 record picking up 22/26 points.December wasn’t exactly easy either as the team lost Burrows, Sestito, Edler, Stanton, Luongo and Alberts to various injuries throughout the month. Sestito is the only one to return to the line up so far. Coming into December the Canucks had not posted back to back wins since October…which sounds pretty unbelievable YET it is very true. They knew they had to be better from top to bottom and it would require everyone to step up. Points are vital to divisional standings and the wildcard spots…and while they have not yet caught the leading Anaheim Ducks, they have closed the gap between themselves and LA and San Jose as they have stacked up some points. Step up indeed they did. They opened December with 7 straight, yes you read that right…7 straight WINS including 5 straight at home and points in 8 straight over all. During that 7-game win streak there were some stand out performances from a few players in particular. The line of Higgins-Kesler-Santorelli showcased some fantastic chemistry while the goal-tenders each posted shutouts. The month opened with Ryan Kesler leading the charge with back to back 2-goal game performances against Carolina and Nashville. The Canucks saw their 2-goal lead disappear very quickly when Carolina scored twice in 10 seconds early in the middle frame to tie the game. The team could have easily buckled in that moment BUT instead Ryan Kesler was quick to take back the lead for the Canucks. Kesler put on a show in the third period against Nashville and made absolutely certain the team took two points home. Phoenix came calling and the Canucks were trying to catch them in the division standings as the gap between the two was closing. After Phoenix came the young Colorado Avalanche who have been aptly coached by the ever colorful Patrick Roy. The Canucks were in complete control of this game from the puck drop however as the Higgins-Kesler-Santorelli line took care of the offense while Luongo stood on his head to lead the team to a 3-1 victory. The stand out in this game aside from Luongo’s stellar goal-tending was Mike Santorelli who has quickly become a fan favourite as he has been easily one of the most consistent players all season long. Did I mention the BIG wins against Boston and Chicago? The atmosphere in Rogers Arena during the Boston game was electric, as loud as a playoff game. It was the first time the Bruins have played in Vancouver since June 15, 2011 and the while the stakes were not high, both teams wanted this victory. Both the Canucks and the fans were ready for this game…and the fans made sure to be heard all game long. Did I mention the unconventional time out called by Torts early in the 2nd period that turned the tide back to the Canucks and they never looked back. Canucks went into the madhouse following a disappointing game in Dallas [their ONLY regulation loss in the month] and did not have the start they hoped for as the Blackhawks took a 2-0 lead. Cue the comeback kids…Daniel Sedin tied the game midway through the third period forcing this game to go to extra time. Over time did not solve the game although Santorelli came awfully close to tying the game with the clock winding down. Eddie Lack took part in his first NHL shootout…an 8 round shoot out in the mad house…and came out on the winning side stopping the likes of Kane, Toews & Hossa! Have I mentioned the injury bug that bit the team in the very first game by taking away Burrows with a broken jaw. Alex Edler and Ryan Stanton were soon to follow…and left our defense seriously drained. Luongo’s injury came in late in the month against Winnipeg and was determined to be day-to-day and left Eddie Lack with the reigns to manage until such time that Luongo returns to the lineup. Lack has been more than capable in helping this team close out the month 2-0-1 picking up 5/6 points including posting his 2nd NHL shutout in his career and in the month. The latest injury came as the month drew to a close to Andrew Alberts, who suffered a concussion after taking a hit from Brian McGrattan early in the game against Calgary. The injury bug hits every team (just look at Pittsburgh!) and if they want to have success they have to find ways to win despite missing key pieces. Injuries while frustrating, allow an opportunity for other players to step into a bigger role and bigger minutes as they help the team move forward. December is a month in which not every win was pretty but the team has had to redefine the ways in which they have won while different role players have stepped up as hero. Torts has made it clear since day one that shot blocking and special teams would be vital to his team’s success. Special teams will be key as they always are moving forward and the Canucks will look to keep improving their power play and penalty kill teams. Shot blocking is expected of each and every player in every situation [5-on-5, 5-on-4 or 5-on-3]. If I have mentioned their power play once, I’ve mentioned it 100 times…it is no secret they struggled with the man advantage early but it has most definitely improved as of late [6 power play goals in their first 20 games, 13 PPG in their last 21 games]. Special teams may not win you every game BUT success long term is much easier attained when your special teams are successful. The Canucks have relied heavily on their strong penalty kill and slowly their power play is catching up as December closed and the season progresses. **Did I mention they have the league’s number ONE ranked penalty kill? As 2014 begins, January will see the return of Luongo, Burrows and potentially Edler. There is no sense in rushing Luongo with Lack’s steady play, but the belief is that Luongo will be back in the lineup by the weekend road trip in California. Alex Burrows will be a spark plug as he always is when he is in the lineup when he makes his comeback. Burrows does more than just score goals, he does all the little things and is a huge asset to our penalty kill unit. Alex Edler will be a welcome addition back to the backend as the defense has taken a few hits thanks to various injuries. Lucky for the Canucks, they have been able to rely on Hamhuis and some unexpected depth but they will gladly welcome back some regulars as the season moves forward. A healthy line up will be key to having success down the stretch and into the playoffs. 41 games in, we are officially at the halfway point in the season, can you believe it? 41 more games remain during which we will see an Olympic break as the Sochi games take the world captive. 41 more games before the playoff madness of a new playoff format will unfold and the wildcards are determined. 41 games before the real work begins for all the playoff contenders. The Canucks closed 2013 with an impeccable 10-1-2 December and an overall 23-11-7 record in the first half of the season. Here’s to a great 2014 for the Canucks and all the teams in the NHL. It’s going to be a wild ride to the finish and we are lucky to be able to watch as it unfolds. October was the month that the Canucks surprised a lot people as they adjusted to Torts’ style. November was the month that the Canucks survived. December was the month that the Canucks thrived and will be looking to build upon that success as they open 2014 with a New Year’s Day game against Tampa Bay [yes I know, not quite as big as the Winter Classic BUT the 2 points that come with it are vital with the ever tight in the Pacific Division]. ***The Team Canada Men’s hockey team Olympic roster will be announced January 7, 2014. [& I expect one or two Canucks to be named to that roster..see what I did there? ].